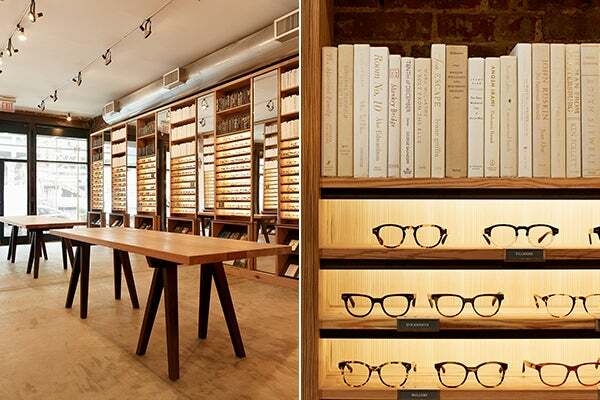 There's no denying that store openings always put a little extra hop in our step, and we've just received news that hipster-eyewear purveyor Warby Parker will be launching its second NYC store at 819 Washington Street, right below the Highline. Basically, our stride is getting bouncier by the minute. As former home to the company's holiday pop-up shop, we have an inkling that they've had their eyes set on this covetable space for quite some time. In any case, the cellar-like setting with massive 'tasting' tables is sure to get visitors quite tipsy on spectacles. For that, Warby Parker deserves a huge congratulations. The company has seen a lot of growth since its inception in 2010. Launched on Penn University's campus as part of the Wharton Business School's Venture Initiation Program, it only took three years for the brand to go from collegiate start-up to NYC pop-up to global phenomenon. And while their genius amenity of being able to try on the goods from home is certainly tempting, getting the better judgement of eye-care professionals might be the wiser of the two options. Regardless, who can resist a top-shelf specs sampling with such luxe surroundings? Opening this Saturday, July 27, we suggest you hop on over to join the party. Photos: Courtesy of Warby Parker.